We’re happy to announce that our latest charity steampunk anthology Some Time Later: Fantastic Voyages Through Alternate Worlds is available for preorder at Amazon, Barnes and Noble, and other online booksellers. The release date is June 1, 2017. Some Time Later will also be available for sale at the steampunk anthology Clockwork Alchemy on Memorial Day weekend. If you enjoyed the popular audio story “Three Men and a Vampire” by Harry Turtledove performed by Sage and Savant and you want more, pick up a copy of Some Time Later and you’ll find a companion story “Three Men and a Werewolf.” You’ll also discover pairs of Jeremiah Willstone stories by Anthony Francis, Drake & McTrowell stories, Miranda Gray stories, and more. If you’re coming to Clockwork Alchemy, stop by Author’s Alley and you can meet many of the authors who participated in this anthology. All the books in the Later series will be on hand, as well as other Thinking Ink titles, and we’ll also have con ribbons and other extras! For Clockwork Alchemy this weekend, Thinking Ink Press is organizing a charity donation drive for the San Jose Public Library, and we have donors who will match that donation up to the first $1000. Stay tuned for the outcome of this drive, but if you want to dive right in to the stories, you can read them now by coming by Clockwork Alchemy and picking up, or looking where fine books are sold! 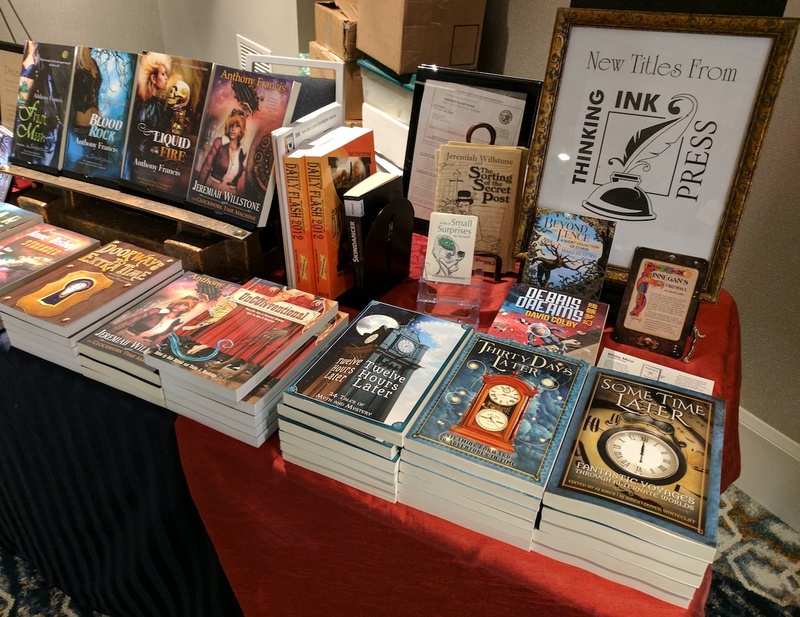 We’re excited to announce that this April, Thinking Ink Press is the featured sponsor of Episode 11 of the continuing Steampunk podcast and blog of Dr. Petronella Sage and her friend Professor Erasmus Savant. Join us as we venture back to the Victorian Science-fiction world of Sage & Savant as they travel through space and time! A new story, “Three Men and a Vampire” by Harry Turtledove, from our forthcoming charity steampunk anthology Some Time Later, Fantastic Voyages Through Alternate Worlds, available at the steampunk convention Clockwork Alchemy 2017. “The Fall of the Falcon” by Anthony Francis, from our charity steampunk anthology Thirty Days Later. “The Fall of the Falcon” is a prequel story to Anthony’s steampunk novel Jeremiah Willstone and the Clockwork Time Machine, new this year from Bell Bridge Books. “The Honorable Eddy” by Kirsten Weiss from our charity steampunk anthology Thirty Days Later. Kirsten Weiss writes genre-blending cozy mystery, urban fantasy, and steampunk suspense, mixing her experiences and imagination to create a vivid world of magic and mayhem. Starting in April, on the Savant & Sage website, you’ll also find interviews with Anthony Francis, Kirsten Weiss, Sharon E. Cathcart, not to mention steampunk anthology editors AJ Sikes, BJ Sikes, and Dover Whitecliff. Please stop in for a visit at the Sage & Savant website and join us for fun and fabulous adventures. If you’re at Clockwork Alchemy 2017, look for Thinking Ink Press authors and editors! Pictured: the Radio Broadcast Center at Universal Studios Florida (modified), from Wikimedia Commons under the Creative Commons Attribution-ShareAlike 3.0 License and Harajuku Fashion Walk (modified), from Flickr / Gaudencio Garcinuño under the Attribution-ShareAlike 2.0 License. 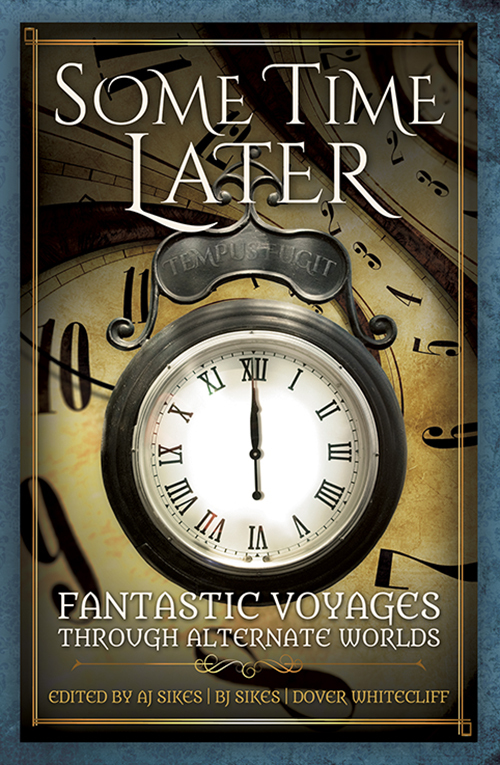 We are excited to announce our next charity steampunk anthology, Some Time Later: Fantastic Voyages in Alternate Worlds, available soon through booksellers in print and ebook editions and at Clockwork Alchemy 2017. Created by returning anthology editors AJ Sikes, BJ Sikes, and Dover Whitecliff, Some Time Later includes two new stories each from fifteen authors including Harry Turtledove, Kirsten Weiss, Anthony Francis, David L. Drake and Katherine L. Morse, Sharon E. Cathcart, T.E. MacArthur, and more. Fifty percent of the proceeds will be donated to public libraries. Take a tour of Jolly Olde London, where madness may (or may not) prevail and things can get hairy after dark! Take an airship to the ancient city of Atlantis! Battle demons! Match wits with mystics! Try to resist the seductive power of chocolate or the magic of tiny mushrooms! Maybe even steal a treasure from a dragon! So put the kettle on, pour a strong cuppa, and curl up on the couch for a rollicking good read with Some Time Later. To order a copy of Some Time Later that you can pick up at Clockwork Alchemy, contact anthony@ThinkingInkPress.com. Back by popular demand, Thinking Ink Press is republishing the out-of-print steampunk charity anthology Twelve Hours Later: 24 Tales of Myth and Mystery. The brainchild of the Treehouse Writers, fifteen talented authors, artists, and poets, Twelve Hours Later was released at Clockwork Alchemy 2015 and features pairs of stories set within the same day. 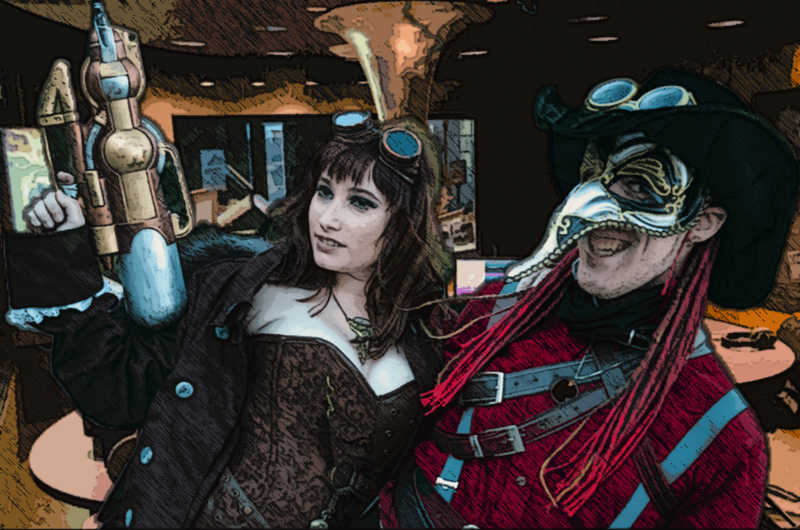 Support public libraries and explore the world of steampunk fiction. Twelve Hours Later, 24 Tales of Myth and Mystery will thrill you with round-the-world and round-the-clock adventure, weaving lore from ancient Egypt, Greece, Japan, and more into a steampunk tapestry! Linked pairs of stories, set 12 hours apart, fill a 24-hour day with a whirlwind of steam, legends, spycraft, and the occasional forest demon! Half the proceeds of the anthology will be donated to nonprofit organizations that support literacy, including the San Jose Library System. As you indulge your literary senses, you’re also helping to promote literacy! Twelve Hours Later will be released on Friday, March 24th, and is available for preorder on Amazon. So get a copy and find out what happens … Twelve Hours Later! That’s right, folks, the steampunk charity anthology Twelve Hours Later is soon returning to bookstore shelves! If you want it first, drop by the Drake and McTrowell booth at the Wild Wild West Steampunk Convention! Check out this wonderful skit in which they investigate the arrival of a mysterious box of books filled with myth, mystery, intrigue, and dirigibles!